The lecture is given to honor the memory of W. Duncan Rannie (1914-1988), the Robert H. Goddard Professor of Jet Propulsion, Emeritus, a faculty member of GALCIT from 1947 to 1981. He developed theories and design procedures for axial compressors during the war; later, his theoretical research on heat transfer in turbulent flow was the basis for much of the progress in gas turbine technology. The W. Duncan Rannie Lecture is made possible through a generous gift from Caltech Alumni Drs. Jain-Ming (James) Wu (MS’59, PhD’65 Ae) and Ying-Chu Lin (Susan) Wu (PhD’63 Ae) who carried out their doctoral research in GALCIT. Through this lecture they honor a professor who has made significant impact in their lives. There is a remarkable range of physical phenomena which are foundational to the successful development of efficient, robust energy and propulsion systems. Understanding and potentially controlling such fundamental phenomena are among the hallmarks of research conducted at GALCIT over many decades, including the pioneering research contributions made by Professor W. Duncan Rannie. In the spirit of a fundamental approach, the talk will describe research at UCLA on flow and combustion instabilities and their control. Focus will be placed on acoustically-coupled combustion processes associated with condensed-phase fuels, as well as the gaseous jet in crossflow, including its shear layer stability characteristics and their control. Interrogation of these rather disparate yet canonical engineering flowfields involves use of experimental diagnostics that reveal heretofore unexplained phenomena. In the problem of an acoustically-driven, burning liquid fuel droplet, phase-locked OH* chemiluminescence imaging reveals a mean (bulk) level of coupling as well as a dynamical coupling between acoustics and reactive processes that have implications for combustion instabilities in a range of propulsion devices. For the jet in crossflow, exploration of shear layer instabilities via acetone PLIF, stereo PIV, and hot wire anemometry enable the determination of flow conditions causing a transition from convective to absolute instability, with attendant alterations in jet structure and the implications for energy-efficient devices. Ann Karagozian has been a Professor in the Department of Mechanical and Aerospace Engineering at UCLA since 1982, the year she received her Ph.D. from Caltech. Her research interests lie in fluid mechanics and combustion as applied to improved engine efficiency, reduced emissions, alternative fuels, and advanced air breathing and rocket propulsion systems. Professor Karagozian is a Past Chair of the American Physical Society/Division of Fluid Dynamics as well as a Past Chair of the UCLA Academic Senate. She was a member of the Air Force Scientific Advisory Board for nearly a dozen years, twice receiving the Air Force Decoration for Exceptional Civilian Service, serving as Vice Chair (2005-2009), and chairing numerous technical studies, including a 2006 study on Air Vehicle Fuel Efficiency and a 2010 study on Future Launch Vehicles. 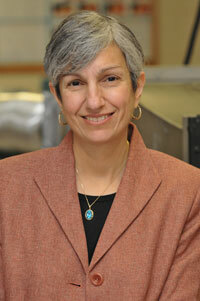 She is a Fellow of APS, AIAA, and ASME, and is a 2013-14 Midwest Mechanics Seminar speaker. She received her B.S. in Engineering from UCLA and her M.S. and Ph.D. in Mechanical Engineering from the California Institute of Technology, working under the guidance of Professor Frank Marble and having had the privilege of taking classes from Professor W. Duncan Rannie and many other distinguished scholars.